One of the requirements in Respiratory Therapy school is for students to know the effects of drugs on the nervous system. I know, I know; this isn’t the most interesting topic for some people. 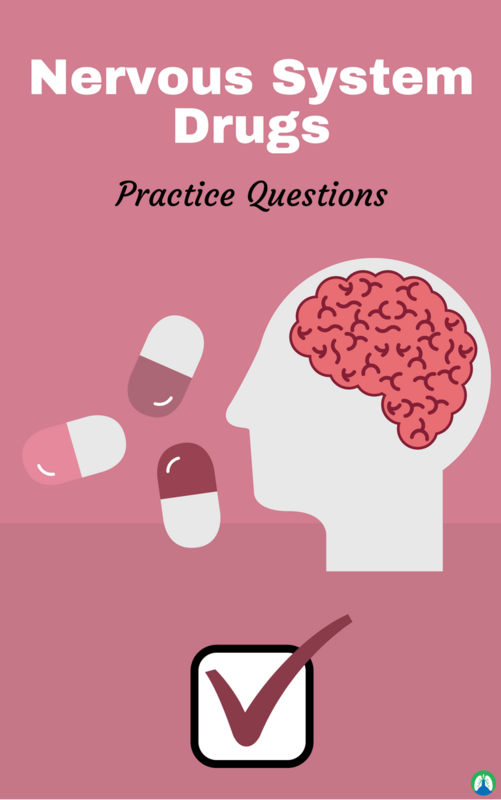 However, too try to make you life easier, we put together this study guide that is loaded with practice questions that can help you learn everything you need to know about the different respiratory drugs and the nervous system. I’m ready to get started. Are you ready to get started? Good, let’s dive right in. 1. What are the two units of the nervous system? 2. What is the central nervous system composed of? 3. What is the peripheral nervous system composed of? It is composed of nerves and ganglia outside of the nervous system. 4. What is the efferent (motor) nervous system? Divided into somatic (voluntary muscle) and autonomic (involuntary), things we do not consciously control like breathing. 5. What is the autonomic branch? Two responses to stimuli: parasympathetic and sympathetic. 6. What does the parasympathetic branch do? The tendency of the body to maintain a steady state. 8. What does the sympathetic branch do? It prepares the body for fight or flight. A hormone that prepares the body to respond to stress. 10. What is the key concept or primary function of the nervous system? Establishes communication between the environment and the outside world. Helps organism maintain homeostasis. Receives sensory input and feel the signal. 12. What is an axon? 13. What are Schwann cells? Create myelin sheath which insulates the axon and speeds up the nerve impulse. 14. What are the axon terminals? Release neurotransmitters which stimulate the next neuron or muscle or gland. 15. What is a cell body? 16. How do signals travel through the neuron across the synapse and affect the next neuron? The neuron resting potential (sodium-potassium pump is in active transport of sodium ions out of the cell while potassium ions remain in cell creating polarity (positive outside of the cell, negative inside cell). Stimulus received by dendrite, if strong enough causes sodium ions to rush into the cell causing a reverse polarity tripping an action potential or nerve impulse. The action potential sweeps along the axon, a wave of depolarization that runs along the axon to the axon terminal. 17. What is an action potential? 18. What is a resting potential? The state of the neuron when not firing a neural impulse. 19. What is the fight or flight response? When an environmental response is extreme enough to warrant a life-threatening situation and an adrenaline response is sometimes necessary. It comes from sympathetic portion of the autonomic division of the nervous system. The result is a faster heart rate and breathing, digestion shuts down and increases in energy to muscles. 20. What is the basic function of the respiratory system? To bring the exchange of oxygen and carbon dioxide between the blood, air, and tissues. 22. What is the physiology of gas exchange in the lungs? Takes place in lungs with each breath. Body carries oxygen from lungs to body tissues and carries carbon dioxide (waste product) in the opposite direction. 23. What is cellular respiration? Takes place in mitochondria and is the release of energy from breakdown of food in the presence of oxygen. 24. What is the Central Nervous System (CNS)? Connects with the brain and the spinal cord. 25. What is the peripheral nervous system? Connects with motor efferent nerves and sensory afferent nerves. 26. What is the autonomic nervous system (ANS)? Connected with the parasympathetic nervous system (PNS) and the sympathetic nervous system (SNS). 27. What is the parasympathetic nervous system? Vegetation and Digestion and parasympathetic activity dominates. 28. What is the sympathetic nervous system? Fight or flight. Sympathetic activity dominates. 29. What are the therapeutic effects of autonomic drugs? Tachycardia, anxiety, agitation, hypertension and insomnia. 30. What happens to muscles during exercise? Dendrites collect signal and axon passes signal thru the myelin into the neuromuscular junction and muscle fiber. 31. What are cholinergic neurons? A nerve cell which mainly uses the neurotransmitter acetylcholine (ACh) to send its messages. 32. What is acetylcholine (ACh)? A compound that occurs throughout the nervous system, in which it functions as a neurotransmitter. 33. What is a neurotransmitter? A chemical substance that is released at the end of a nerve fiber by the arrival of a nerve impulse and, by diffusing across the synapse or junction, causes the transfer of the impulse to another nerve fiber, a muscle fiber, or some other structure. A neurotransmitter is a chemical messenger that allows the impulse to move across the synapse from one neuron to another. It is released from the axonal nerve endings and combines with receptors on the dendritic side of the synapse. It causes a stimulatory or inhibitory effect. Certain drugs can mimic or block certain neurotransmitters. 34. What are cholinergic neurons? Nerve impulse diffuses across the synapse or junction and transfers impulses to ACh causing a cholinergic response in the target tissue. 35. What are the target tissue responses to the sympathetic nervous system? Miosis in the pupil, cardiac output increases, bronchodilation, reduction in G-I secretions/motility and relaxation of smooth muscle in the urinary bladder. 36. What are SNS adrenergic neurons? These neurotransmitters are released at a location known as the synapse, which is a junction point between the axon of one nerve cell and the dendrite of another. Classification of responses as active or passive target tissue responses. 37. What are the effects of cholinomimetic drugs? Reduce heart rate, increase mucous secretions, increase G-I motility, increase in secretion of digestive enzymes and contraction of the bladder. 38. What is sympathomimetic pharmacology? The studies of drugs that activate the effects produced by norepinephrine during fight or flight states. 39. What can we learn more about as we understand more about synapses? We can understand more about many of the diseases that affect the peripheral, central nervous systems and we can understand more about how commonly used drugs have their effect. 40. What are the four main ways in which drugs affect synapses by increasing the response? Increases the amount of neurotransmitter synthesized, increases the release of neurotransmitter from the vesicles at the presynaptic membrane, binds to post-synaptic receptors and activates them or increases the effect of normal neurotransmitter, and, prevents the degradation of neurotransmitter by enzymes or prevents reuptake into presynaptic knob. 41. What are the four main ways in which drugs affect synapses by decreasing the response? Blocks synthesis of the neurotransmitter, causes neurotransmitters to leak from vesicles and be destroyed by enzymes, prevents the release of neurotransmitter from vesicles and blocks the receptors and prevents neurotransmitter binding. A drug found in cigarettes that mimics the effect of acetylcholine and binds to specific acetylcholine receptors in post-synaptic membranes known as nicotine receptors. 43. What does nicotine do? It triggers an action potential in the post-synaptic neuron, but then the receptor remains unresponsive to more stimulation for some time. 44. What can nicotine do to heart rate and blood pressure? It can cause them to increase. 45. What can nicotine do in relation to neurotransmitters? It can trigger the release of another type of neurotransmitter in the brain by dopamine. 46. What is dopamine associated with? 47. What does nicotine have at low doses? 48. What effect does nicotine have at high doses? It blocks the acetylcholine receptors and can kill. 49. What are some more details about nicotine? It is a highly addictive drug. Even at low doses, nicotine has a big effect on the acetylcholine synapses and dopamine release is large. A drug used as a local anesthetic that works by blocking the voltage-gated sodium channels in post-synaptic membranes. 51. What is a synapse? The space between two neurons or between a neuron and its receptor. 52. What are the divisions of the PNS? Somatic Nervous System and Autonomic Nervous System. 53. What is the somatic nervous system? Efferent nerves that carry impulses from the CNS to skeletal muscle and voluntary. 54. What is the autonomic nervous system? Efferent nerves that carry information from the CNS to cardiac muscle, glands, and smooth muscle, involuntary, sympathetic nervous system, adrenergic, parasympathetic nervous system and cholinergic. 55. What is the sympathetic nervous system? Neurons originate in the thoracolumbar spinal cord, fight or flight, short preganglionic fibers: acetylcholine (Neurotransmitter at preganglionic synapse) and long postganglionic fibers: Epinephrine or norepinephrine (Neurotransmitter at postganglionic synapse). 56. What are the sympathetic receptors? Alpha 1, alpha 2, beta 1, beta 2 and dopaminergic. 57. What is an alpha 1 receptor? Smooth muscles of blood vessels and increases blood pressure by constriction of arterioles (except in GI tract). 58. What is an Alpha 2 receptor? Postganglionic sympathetic nerve endings, inhibits release of norepinephrine resulting in sedation and analgesia and bradycardia, decreased BP and cardiac output. 59. What is Beta 1 receptor? Heart and increases heart rate, conduction, and contractility. 60. What is Beta 2 receptor? Smooth muscles of lung and bronchodilation and dilation of skeletal blood vessels. 61. What is the parasympathetic nervous system? The “homeostatic” system (energy-conserving activities), opposite to sympathetic nervous system effects, neurons originate in the craniosacral spinal cord, long preganglionic fibers: Acetylcholine (neurotransmitter) and short postganglionic fibers: Acetylcholine. 62. What are parasympathetic receptors? Muscarinic: Stimulate smooth muscles and slow the heart rate and Nicotinic: Affect skeletal muscles. 63. What does autonomic nervous system drugs do? May affect either the parasympathetic or sympathetic nervous systems and mimic neurotransmitters, interfere with neurotransmitter release, block the attachment of neurotransmitters to receptors, and interfere with the breakdown or reuptake of neurotransmitters at the synapse. 64. What are the parasympathetic nervous system drugs? 65. What are cholinergic drugs? Also known as parasympathomimetics, mimics the action of the parasympathetic nervous system, mimics the action of acetylcholine (direct-acting), selective for muscarinic receptors, affects the smooth muscles of the urinary and GI tracts, inhibits acetylcholine breakdown (indirect-acting), side effects: bradycardia, hypotension, diarrhea and vomiting, increased secretions (intestinal, bronchial, ocular). 66. What are anticholinergic drugs? Also known as parasympatholytics, blocks the action of acetylcholine at muscarinic receptors; affects the heart, respiratory tract, GI tract, urinary bladder, eye, and exocrine glands; and, side effects: tachycardia, constipation, dry mouth, dry eye, and drowsiness. 67. What is edrophonium (Tensilon)? It is an indirect-acting cholinergic drug use to treat patients with myasthenia gravis. 68. What is neostigmine and physostigmine? Indirect acting, cholinergic drug, treats rumen atony, intestinal atony, and urine retention; and, antidote to neuromuscular blocking agents. It is an anticholinergic drug and pre-anesthetic to prevent bradycardia and to decrease salivation, dilate pupils for ophthalmic examination, control ciliary spasm of the eye, treat bradycardia, an antidote for organophosphate poisoning and slows hypermotile GI tract. 70. What are the sympathetic nervous system drugs? Adrenergic and adrenergic blocking agents. 71. What are adrenergic drugs? Also known as sympathomimetic or catecholamines, simulates the action of the sympathetic nervous system; acts on one or more adrenergic receptors on smooth muscle cells; side effects: tachycardia, hypertension, cardiac arrhythmias; and, naturally occurring catecholamines: epinephrine, norepinephrine, and dopamine. It is a synthetic catecholamine, adrenergic drug, and is used in emergency situations for cardiac resuscitation and treatment of anaphylaxis. It is a synthetic catecholamine, adrenergic drug, and increases blood pressure. It is a synthetic catecholamine, adrenergic drug, and promotes bronchodilation. It is a synthetic catecholamine and adrenergic drug for shock and congestive heart failure, and it increases renal perfusion. It is a synthetic catecholamine, adrenergic drug, and heart failure. 77. What are albuterol, terbutaline, and isoetharine? They are synthetic catecholamines; adrenergic drugs that treat bronchospasm (by producing bronchodilation). 79. What are the adrenergic blocking agents? Also known as sympatholytic, blocks the effects of adrenergic neurotransmitters; either occupies the receptor or inhibits the release of the neurotransmitter; classified as to the site of their action: alpha blocker and beta blocker. Promote vasodilation, decrease blood pressure and side effects: tachycardia and hypotension. Decrease heart rate, decrease blood pressure and side effects: bradycardia and hypotension. Adrenergic blocking agent, beta blocker, cardiac arrhythmias and hypertrophic cardiomyopathy. 83. What are CNS drugs? Alter nerve impulse transmissions between the spinal cord and the brain or within the brain itself, affect neurotransmitter activity, cause depression or stimulation, anticonvulsants, tranquilizers/sedatives, barbiturates, dissociative, opioids, opioid antagonists, neuroleptanalgesic, stimulants, analgesics and euthanasia agents. 84. What are the effects of alpha-2 agonists? Prescribed for pain relief and Categories: non-narcotic: mild to moderate pain. Act on peripheral nervous system; narcotic (opioids): moderate to severe pain. Act mostly on CNS. 86. What are CNS stimulants? Used to reverse CNS depression; Doxapram: stimulates brainstem to increase respiration; Use with caution in animals with a seizure: history; Methylxanthines: inhibit an enzyme that breaks down cAMP; examples: caffeine, theophylline, aminophylline; and, cause CNS stimulation, GI irritation, and bronchodilation. 87. What does sensory neuron (afferent) do? Send into from the rest of the body to CNS. 88. What does efferent neuron do? Send into from the CNS to the rest of the body. 89. What occurs in the somatic motor division? 90. What does the autonomic division do? Neurons control smooth and cardiac muscle, exocrine and some endocrine glands, some adipose tissue. 91. What is a reflex? An automatic response to a stimulus. 92. What is a preganglionic neuron? Originates in CNS and projects to postganglionic neuron outside of CNS. 93. What is a ganglion? It is a cluster of nerve cell bodies in PNS. 94. What is the description of sympathetic pathways? They originate in the thoracic and lumbar regions of the spinal cord. 95. What is the description of parasympathetic pathways? They originate in the brainstem or the sacral region for control of pelvic organs. 96. What is the vagus nerve? Contains about 75% of all parasympathetic fibers and carries sensory info from internal organs to brain and motor (somatic and autonomic) info from brain to organs. 97. What is the adrenal medulla? Secretes epinephrine and norepinephrine into the blood. 98. What does the somatic motor pathway do? Consists of one neuron connecting the CNS to the target organ. 99. What does the somatic motor neuron do? Release acetylcholine at the neuromuscular junction. Thank you so much for reading all the way through our practice questions on the effects of drugs on the nervous system. I truly hope this study guide can help you learn and understand this information (because, trust me, I know how dense this material is). If you go through these practice questions enough, I have know no doubt that the information will eventually begin to stick, and that’s what it’s all about. Thanks again for reading and as always, breathe easy my friend.